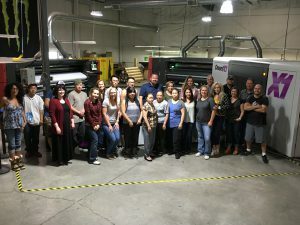 FUJIFILM North America Corporation, Graphic Systems Division’s Onset X1 with White offers high speeds and high quality at KD Kanopy, the ‘premier purveyor’ of pop-up canopies, located near Denver, Colorado. Over the past three decades, KD Kanopy has led the portable tent, canopy, banner, and signage industry with a continuum of new products and designs to help their clients attract new customers. KD Kanopy’s ‘high quality big tents’ are created for a global client base. Upwards of 1,320 square feet, they stand o ut and get noticed. The Onset X1, producing 4,304ft2 per hour (80 beds/hour) features eight active channels, with four channels printing CMYK, and the remaining channels configured as needed using a combination of Light magenta, Light cyan, White, and Orange (Lm, Lc, W, O). The staff at KD Kanopy gather around their Onset X1, right. Prior to their Onset purchase, Seltzer and his colleagues visited Fujifilm’s Americas Technology Center in Chicago, and were well prepared for their hands-on experience. KD Kanopy is gaining new jobs, and customers, since acquiring their Onset X1. “Without question we are seeing an increase in jobs, and we haven’t even touched the tip of the iceberg yet,” says Seltzer. KD Kanopy is looking into printing on corrugated boxes and manufacturing POP displays to expand their reach with current and prospective clients. The Onset X1 has given KD Kanopy a welcomed boost in productivity and output, while also reducing production labor costs. “The Onset X1 has increased my production, it’s literally six to eight times faster than what we were getting on the roll-to-roll device, with regard to handling flexible material and sheeting it prior to printing,” says Seltzer. “The abilities and capabilities that we have now with this machine are just amazing; the Onset X1 has certainly transformed our business,” concludes Seltzer. To learn more about KD Kanopy, please visit: www.fkdkanopy.com.